The adaptation of CCM at Lancaster Baptist Church in Lancaster, California, home of West Coast Baptist College, is far-reaching, extends back many years, and continues to this time. I first became aware of this in my trips overseas, in places such as Australia and the Philippines. Many churches that are being influenced by Lancaster/West Coast are on a fast track to the contemporary philosophy. “In Christ Alone” by Getty/Townend has been performed at Lancaster/West Coast. The Gettys are one-world church builders. In July 2012, they joined Roman Catholic Matt Maher on NewsongCafe to promote ecumenical unity. “Stronger” by Darlene Zschech/Hillsong was performed by Lancaster high school’s mixed ensemble in 2011 and Hillsong’s “Mighty to Save” was performed in February 2012. Zschech/Hillsong are one-world church builders who have performed for Catholic Youth Day and Pope Benedict. “Majesty, Worship His Majesty” by Jack Hayford has been performed at Lancaster/West Coast. “Majesty” is a Pentecostal ‘kingdom now’ anthem, and Hayford is a one-world church builder who says that God personally told him not to preach against the Roman Catholic Church. “Faithful Men” by Twila Paris has been performed at Lancaster/West Coast. Paris works with Kathy Troccoli, a Roman Catholic musician, and with ecumenist Robert Webber, who promoted unity between evangelicals and Catholics. “In Christ Alone” by Michael English was performed at Lancaster/West Coast. English is an ecumenist who spent the 1990s and early 2000s committing adultery with another man’s wife, bar hopping, dating a stripper, and undergoing “rehab” for drug addiction. Songs by Geron Davis have been performed at Lancaster/West Coast. Davis is an ecumenist and “Jesus Only” Pentecostal who denies the Trinity. “I Will Rise” and “Amazing Grace (My Chains Are Gone)” by Chris Tomlin was performed at Lancaster/West Coast. Tomlin is an ecumenist and member of an emerging church that seeks to build the kingdom in this present world. Tomlin, a one-world church builder, says “Music unites.” He has a close ministry relationship with Roman Catholics Audrey Assad and Matt Maher. The latter’s goal is to unite “evangelicalism” with Roman Catholicism. “Word of God Speak” by MercyMe was performed at Lancaster in 2011. MercyMe is a hard-rocking contemporary band that is both ecumenical and charismatic. In early 2011 MercyMe included Roman Catholic Matt Maher on their Rock & Worship Roadshow. Songs by Graham Kendrick have been sung at Lancaster/West Coast. Kendrick is a charismatic who says he was baptized with the Holy Spirit while brushing his teeth. A one-world church builder, Kendrick is co-founder of the radically ecumenical March for Jesus that unites everyone from Roman Catholics to Mormons. “Above All Things” by Rebecca St. James was covered on West Coast Baptist College’s For the Faith of the Gospel CD. St. James is a hard-rocking ecumenist who performed for Pope John Paul II in 1999 and recommends books by the New Ager M. Scott Peck. 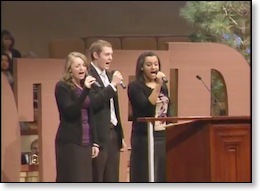 “Glorify You Alone” by Gateway Worship was performed at Lancaster in March 2012. Gateway Worship is a radically charismatic outfit whose objective is to bring people into a “sense and experience of God’s presence.” William Young, author of The Shack, which depicts God as a non-judgmental female entity, spoke at Gateway’s Father’s Heart Seminar in 2012. “Step by Step” by Rich Mullins was performed at Lancaster’s Youth Conference 2012. Mullins was a one-world church builder and was reported to have been near to converting to Catholicism when he was killed in an automobile crash. WE USE LUTHER’S HYMNS, DON’T WE? It has been argued that since Baptist churches use Protestant hymns, it is acceptable to use contemporary worship songs that are have a biblically sound message. The answer is that there is no comparison between these two practices. Those who are making this argument don’t understand the issue and are uneducated about the character and nature of contemporary worship music and of the spiritual world that it represents. To see the difference between using old Protestant hymns as opposed to borrowing from the world of contemporary worship, all we need to do is consider the fruit. As for youth groups, show me one that is messing with contemporary music, and I will show you one that is on a fast track to the world. This fact speaks volumes to those who have an ear to hear. The old Protestants were much closer, doctrinally and spiritually, to the position of an old-fashioned Baptist church than to that of the contemporary movement. The old Protestants were militant for the Christian faith and were not infiltrated by theological modernism and new philosophy. They hated Popery! In contrast, the contemporary worship crowd represents a philosophy and a movement of end-time apostasy that is diametrically opposed to an “old-fashioned” Bible stand. It represents a world that is an absolute enemy of what an “old-fashioned” Baptist church stands for. There is a transformational power in contemporary worship that can and eventually always will change the very character of a Bible-believing separatist church. This is because the contemporary worship crowd represents the one-world church. Almost to a man the influential contemporary worship artists are radical ecumenists who do not separate from the Roman Catholic Church as the old Protestants did, but who affiliate with Rome. We have documented this extensively in the free 500-page eBook The Directory of Contemporary Worship Musicians. Consider the very popular contemporary hymn writers, Keith and Kristyn Getty. Their songs are used used widely among “traditional, non-contemporary” churches, because they are considered relatively safe. At least eight of their songs are included in Majesty Music’s Rejoice Hymns. Twenty-nine of their songs are featured in Hymns Modern and Ancient, published by Heart Publications, a ministry of Steve Pettit Evangelistic Association and compiled by Fred Coleman who heads up Bob Jones University’s Department of Church Music. Both Crown Baptist College and West Coast Baptist College, the two largest independent Baptist Bible colleges, perform Getty material in their services. Yet the Getty’s one-world-church goal is to “bring everyone together musically” (www.keithgetty.com). In July 2012 the Gettys and their close friend Stuart Townend joined Roman Catholic Matt Maher on NewsongCafe on WorshipTogether.com. They played and discussed “The Power of the Cross,” which was co-written by Getty-Townend. The 10-minute program promoted ecumenical unity, with Maher/Townend/Getty entirely one in the spirit through the music. Dramatic doctrinal differences are so meaningless to this crowd that they are not even mentioned. Spiritual abominations such as papal supremacy, the mass, infant baptism, baptismal regeneration, and Mariolatry were entirely ignored. Jude 3 is despised and Romans 16:17 completely ignored for the sake of building the one-world church through contemporary Christian music. Preachers who claim to believe in biblical separation and end-time apostasy and who claim that they want to keep their churches in the “fundamentalist” philosophy and orb, but who are playing with CCM, are playing with fire; and their people, and especially the next generation, are going to be burned. These preachers can huff and puff at me all they want, and they can try to make me the issue in this battle, it doesn’t change the fact that they are playing with fire. It doesn’t change the dangerous character of contemporary worship music. Time will tell, but that will be too late for those who do draw clear lines of separation from contemporary worship. For documentation of the great spiritual danger represented by contemporary worship musicians that are being used by Bible-believing churches and the fact that this music is a bridge to the one-world church see the following free materials at www.wayoflife.org.